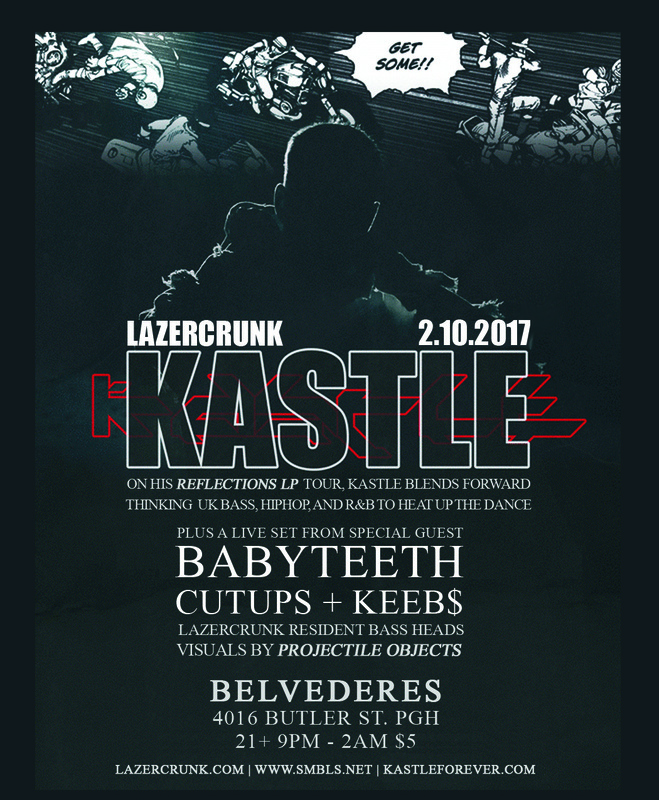 Fri Feb 10th LAZERCRUNK w/ Kastle (LA), Babyteeth + 1st Belvies edition! On his REFLECTIONS LP tour, Kastle is back again on his home turf, bringing his original, melodic blends of forward thinking uk bass music, garage, hiphop r&b to heat up the dance. For 2017, we’ve decided to break out of the mold of the past several years, and alter our format to mix things up and bring some fresh energy. Going forward we’ll be having four quarterly nights at our original home base, BRILLOBOX (Mar, June, Sept, Dec) and four quarteryly nights at the original ultra-dive, BELVEDERES (Feb, May, Aug, Nov). We’re also re-dedicated to bringing in unique visuals and themes that you won’t see at any other regular event, as well as keeping pushing things forward with top quality guests, both touring and local. Beyong that, we’ll never take ourselves too seriously – LAZERCRUNK is all about letting loose and having fun. Originally part of a small crop of American artists inspired by dubstep, garage, grime, jungle and other ‘nuum sounds, Kastle has transitioned through multiple aesthetic iterations since he burst into the popular consciousness 6+ years ago, fostering a thriving touring career, releasing a critically and commercially successful debut album, and heading up his own wildly successful label. Across several releases on his own Symbols label, the Los Angeles-resident has filtered hip hop and R&B through the aforementioned UK sounds, developing a sound rife with pop consciousness and a keen sense of melody, all while retaining a strong devotion to under-the-radar sounds. In between playing festivals like Coachella, Decibel, Lightning In A Bottle and Burning Man, it’s remarkable that Kastle has had time for any other creative pursuits, but along with his own trailblazing production work, he also functions as an A&R, mixtape curator and tastemaker DJ. The rare musician with the fan base and clout to regularly play massive festivals and, at the same time, develop a visceral connection to the young artists that are likely to take the proverbial torch in the coming years. At Symbols, avant-garde releases aren’t the exception, but the rule and the label is now made up of a deep, diverse group of producers pushing American and UK sounds forward at a blistering pace. Having extensively toured Europe, the UK, Australia and North America, Kastle has the wit and wherewithal to play large stages and tiny rooms, filtering leftfield bass music into his own idiosyncratic aesthetic. You’re just as likely to become engrossed in science fiction motifs as you are sweltering low end in a Kastle set and his forthcoming work sees the artist extend into ever more abstract, moving sonic space. And with ever-expanding curiosity in the worlds of tech and science, the concepts and ideations that make up Kastle’s songs don’t end when the song ends, instead continuing to make up his figurative and literal body of work. Across best selling records, global tours and dozens of Symbols releases, Kastle has shown marked progression, his sound always developing around a core set of ideals. His output might not all sound the same, but a thread of never-ceasing evolution is present throughout, making Kastle one of America’s most indispensable contributions to the dance music continuum.